Even when it's not freezing, comfort food hits the spot. I don't remember my mom ever making white lasagna - we were always straight up traditional style. And of course my Nana's lasagna is always a huge hit. But sometimes, you need to change it up a bit. Preheat oven to 350 degrees. Boil noodles according to package instructions. Meanwhile, in a bowl, combine ricotta, egg and grated cheese. Add a pinch of salt and pepper. In a pan, heat a little extra virgin olive oil and saute onion, spinach, garlic and artichokes. Season with salt and pepper while cooking. Cook until soft. In a saucepan, melt butter, then add flour and stir until lumps are gone. Add milk, followed by nutmeg and a little salt and pepper. Whisk constantly until thick. Spread a little bechamel on the bottom of a 9x13 pan. Cover with a layer of noodles, then add half of the veggie mixture. 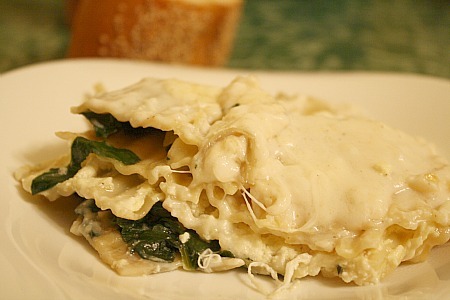 Follow with a layer of noodles, and top with the ricotta mixture. Add more noodles, then the rest of the veggies. Top with noodles, followed by mozzarella, then pour bechamel all over the top and sides. Bake for around 35 minutes, or until top is bubbly and lasagna is cooked through the middle and center of pan. I'm supposed to be avoiding tomato, so I think next time I make lasagna this may be the one. Yum! 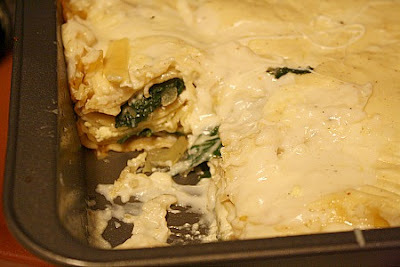 I've never had a white lasagna but it looks so delicious. I'll have to give it a try soon. We are definitely not close to 56 degrees here, so bring on the comfort food!